Some people only experience it a few times in life: those times when everything is going your way. But, in point of fact, the experience occurs much more often than we realize, we are just too distracted by e-mail, blackberries, cell phones, thinking of tomorrow, next week, next year to realize it. What I call Perfection of Moment is when all of your senses are firing with pleasure-- Sight, Sound, Touch, Smell-- and being fully aware in that moment, allowing the experience to wash over you, to fill your mind, to populate your memory. It could be riding your bike at high speed down a hill with your favorite song on your iPod, feeling the wind, seeing the world whipping by, smelling the air, letting your heart pump to the beat of the song. It could be watching your children do their favorite thing. Don't' think of work, or what you are going to do tomorrow, watch them, hear them, feel your elation or sorrow as they succeed or fail. And of course, making love is the most obvious perfection of moment. The point is, it is the experiences that we live that help us to fill the pages when we write. They say write what you know and what we know can be exhausted by our second book. But we can write about fear, we can write about adrenaline and triumph, we can write by putting ourselves in others shoes with some amazing fun experience that will make our writing stronger, more real, more visceral. And so on the next page you will find ten experiences that can enrich your writing, allow you to have a well spring of thought, emotions, and feelings to draw upon and have some fun at the same time. I know, because I have done them all plus too many other things to mention. So remember to stay in the moment. Allow those senses to sense it all without distraction. And remember to remember. PLEASE NOTE: I do not promote, condone, or encourage any of these actions. You are assuming the full risk when engaging in any of these ten items and I cannot be held responsible for any and all outcomes. 1. Jump out of a plane (with a parachute). Either tandem or solo. Feel the emotion as you stand in the open door for the first time, looking 13,000 feet down. Feel the wind in your face as you fall for close to a minute. Think about flying, think about what if. 2. Shoot a gun. Go to a range. Shoot a variety of pistols: 45's, 38's. Then shoot a shotgun and a rifle. Feel the power of the gun in your hand; understand that you hold life and death between your fingers. Look at the bullet, realize how small it is, how deadly its potential. 3. Run for your life. Get chased. Chase someone. Feel the adrenaline course through you, feel how it quickens your heart, gives you speed and strength. Feel the residual, uncontrollable shakes when you are done. 4. Stay on the bottom of a pool for as long as you can. Wear goggles. Look around, feel your lungs burn, feel the throbbing of your pulse, hear the silence around you, know what it is like to be minutes from death. 5. Stand in the middle of a rain storm. Allow yourself to be soaked, feel your clothes as they gradually get wet until you are drenched, smell the air. Feel the water cascade down your face. Hear it pounding the ground around you. 6. Kiss your significant other with your eyes open, make love to them with the lights on staring into each other's eyes in the throes of passion. Be aware of their touch, of the look in their eyes, of the wetness of their kiss, the rhythm of their breathing. 7. Do something completely out of your comfort zone, something embarrassing. Sing in front of a crowd, dance in the middle of a bar, tell an audience your most embarrassing moment. Take a chance, if you succeed, great, if you fail, even better. Remember that feeling. 8. Stand on the platform of the train station for 60 minutes at rush hour. Watch the crowd, the clothes, the attitudes. Watch the kindness and rudeness, the interaction of both strangers and friends. 9. Go to a restaurant. Eat alone and watch the reaction of the people; feel their stares as they assume your state of life. Notice how some will avoid making eye contact; others will be overly kind out of pity. 10.Go to a different house of worship. Sit through their prayers, sermons, and rituals. See how similar it is to your own religion, see how different. Watch the people, the individual leading the service. Watch how different people are once they exit the church, temple, synagogue, or mosque. Then go home and write, pour these experiences into your characters, paint their emotions with your own. And remember to pay attention when all of sudden you have written something you're proud of, remember that feeling, embrace it, enjoy that triumph and use it in your next story. Every successful author will tell you to be a great writer you must write every day. True. But that doesn't hone your craft as a story teller. I don't care how well you write, how good your prose is, how deep your vocabulary is, in this day and age, story is king. As writers of fiction, we need to distinguish ourselves, make our stories stand apart. How many police procedurals are out there? How many stories of love lost and found; how many tales of the handsome detective/Navy SEAL/Covert Agent are there? What makes the great ones stand out? Great original story. I have what I call the everyday story file. Every single day I jot down a quick story, I have been doing it for a long time and so I have amassed a large file of stories which I have drawn on to write novels, Vooks, and movies. Creating compelling stories is an art. So often when someone finishes a novel they take the first or second idea that has been floating in their head for months and run with it. But what if you have a file of ideas to draw on, a file with over 300 ideas in it? If you want to write a great story you have to create a new story every day. Every single day, 365 days a year. Nothing big. No more than a page, usually just a quick paragraph or two, maybe the three act approach. Write anything, write something out of your comfort zone, write something no one would believe you would write. Granted most of the ideas will probably stink, you may not want to repeat them to anyone, but think of this: if only five percent of those ideas are good, that's 18 good ideas! And If 1% are great that's 3 great ideas. Of course you may marry some of your ideas together and come up with something completely different. But more importantly, you will open your mind, you will tap that well spring of creativity, the place where your childhood imagination ran wild. By doing this you will hone your craft as a story teller, because after all, the public wants great stories, new stories, Hollywood and publishing want the next great idea. If you only ponder a story a few times a year you might get lucky once in a while but in this day and age we can't rely on luck. By example, The 13th Hour was an idea I had on April 26th 2008 of a story told in reverse, I had another idea from January 14th 2008 that involved a man going back in time in one hour increments to save his wife who had already died. 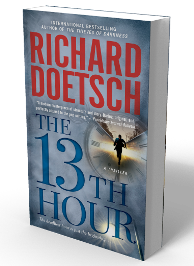 I put them together and wrote The 13th Hour in July 2008. Embassy was an idea from February 2009 that was sparked as I was walking by the Russian Consulate on the upper east side of Manhattan. It was a what if scenario about a hostage crisis within the walls of a foreign Embassy in New York, a place that U.S. law enforcement can't enter. And The Thieves of Darkness encompasses six different ideas that ended up fitting together like a jigsaw puzzle. So when you listen to all the experts out there, all the people that say write everyday, you should listen, but just as important you should create every day, dream every day, formulate a story every single day and file it away. And think of it this way, you get to free your mind for fifteen minutes from your current writing assignment. How great is it to let the mind wander, to go anywhere it wishes or is taken? If you don't believe me, try it for a month and see what happens, you will be surprised what you come up with. Hope all is well with all. Now in Paperback Feb 2011! "Whip-smart and lightning-paced... This novel left me breathless and awed by the scope and scale of this story. Truly a masterwork by an exploding talent."